Register for the NETS-2018 post-meeting tour of NNSS. We have reached 40 sign-ups for the NNSS tour. Additional sign-ups may still be submitted and will be placed on a waiting list, in the order received, in case of cancellation by anyone in the first 40 sign-ups. 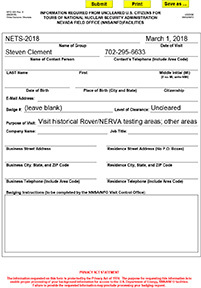 Register for the post-meeting tour of the Nevada National Security Site (NNSS) – Rover/NERVA areas and National Criticality Experiments Research Center (NCERC). Maximum number of participants is 40 (first come, first served). You must be a US citizen to participate in the tour (proof of U.S. Citizenship with a valid “Real ID” will be required).